April is all about diamonds – the month’s birthstone – and is also all about Spring Sales, so here we go with another Magnificent Jewels Sale, with more magnificent diamonds, always at Sotheby’s, but this time to New York, next April 21. Same as in the Magnificent Jewels and Jadeite Spring Sale, which will be held at Sotheby’s Hong Kong, also on this occasion diamonds will play the leading role, with some faboulous gemstones literally taking the stage. Not only white fire, but also more coloured gemstones, which include a super selection of Kashmir Sapphires, some rare and iconic Art Deco jewels signed Cartier, and more jewels of celebrated provenance. Here are then the Sale’s highlights, and you will not be disappointed – with more than 350 pieces, this auction is estimated to achieve in excess of $50 million. Diamonds will take the leading role. Indeed, one diamond will be presented, unlike any offered before: an extraordinary 100-carat perfect diamond in a classic Emerald-cut (est. $19-25 million), which I already showed you in this preview post. Diamonds of such a scale and with these characteristics (D colour and Internally Flawless clarity) are extremely rare, and what makes this diamond even more precious is its shape, as this is the largest perfect diamond with a classic emerald-cut ever to be offered at an auction. 100-carat perfect diamond, emerald-cut. D colour, Internally Flawless clarity. Originally weighing 200 carats in its rough form, this diamond was mined by De Beers in Southern Africa, and it has been cut to the shape we can admire today by its current owner after one year of intense study. This is a Magnificent Platinum, 18 Karat Gold, Fancy Purplish Pink Diamond and Sapphire Ring (est. $2.5-3.5 million). Quite a bold and unusual combination of an unmodified pear-shaped Fancy Purplish Pink diamond weighing 6.24 carats, set in a unique mounting with two cushion-cut Kasmir sapphires of 2.44 and 2.36 carats. April is my month, I am in love with blue diamonds, and I would die to receive as a birthday present The Monarch Blue Diamond, an Important Platinum, Rose Gold, Fancy Blue Diamond and Coloured Diamond Ring. Estimated $3.5-4,5 million, this ring is centering an oval-shaped mixed cut Fancy Blue diamond of 6.06 carats, VVS2 clarity and complemented with six pink-hued round diamonds. A dream. Out of the collection of a prominent collector is this Magnificent Platinum and Diamond Ring, featuring an oval-shaped diamond of 22.30 carats, D colour, Internally Flawless, Type IIa, and estimated $2.8-3.2 million. Finally, here is a Highly Important Platinum and Diamond Pendant Necklace. This necklace presents a suspended pear-shaped diamond of 52.26 carats, D colour, SI1 clarity, with excellent polish and symmetry. Estimate is of $3.8-4.2 million. The Magnificent Jewels at Sotheby’s New York will also present two seminal Cartier Art Deco jewels. The first jewel is The Baron de Rothschild Necklace, an Elegant and Rare Platinum, Emerald, Sapphire, Lapis Lazuli and Diamond Pendant Necklace. This is a Mughal Empire-style necklace which was recently on exhibition at the Denver Art Museum’s “Brilliant: Cartier in the 20th Century”. This necklace was acquired by Baron Eugene de Rothschild in 1924 for his wife Catherine: signed by Cartier and designed by the Maison’s chief designer Charles Jacqueau, the blue and green jewel presents three colored stones carved with Mughal floral motifs. The estimate is of $1.8-2.2 million. The second jewel is an Iconic Platinum, Emerald, Ruby, Diamond and Enamel “Tutti Frutti” Bracelet, signed by Cartier New York, circa 1928. “Tutti Frutti” bracelet from the collection of Evelyn H. Lauder. Yet, each and every one of these bracelets is a unique work of art, and this one in particular features a delicate black enamel frame around each jeweled flower and leaf flourishing from the diamond set vine. Estimate is of $1.3-1.8 million. At the beginning of this post, I also introduced important sapphires. 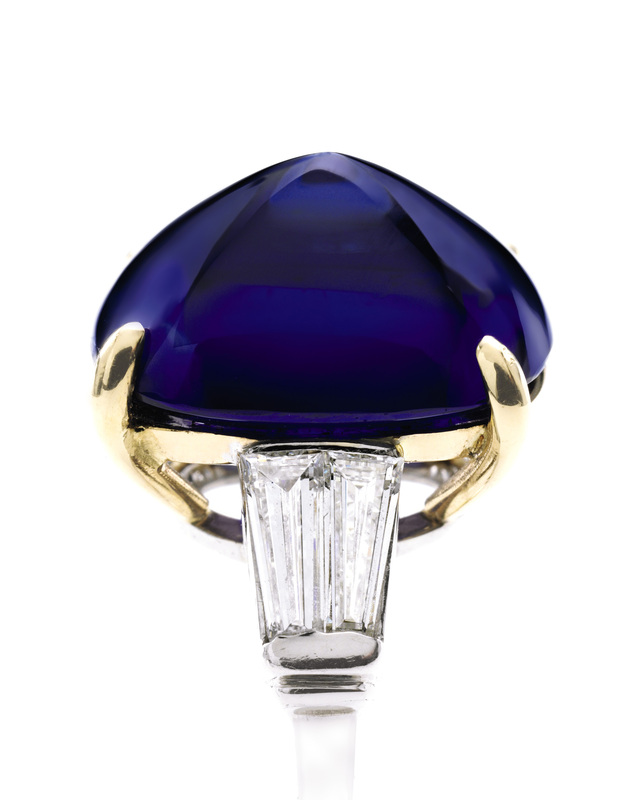 The first one is a Superb Platinum, Kashmir Sapphire and Diamond Ring, signed by Cartier New York, circa 1915. The cushion-cut sapphire weighs 11.90 carats and is accompanied by Gubelin Gem Lab Report stating that the stone “possesses a richly saturated and homogeneous colour, combined with a high degree of transparency, and a finely proportioned cut.” The estimate is of $1.4-1.8 million. Another work of art, and a ring I immediately fell in love with, is this Important Platinum, 18 Karat Gold, Kashmir Sapphire and Diamond Ring. Set with a sugarloaf cabochon sapphire weighing 9.94 carats. Estimate is of $700-1.0 million. The last remarkable sapphire Sotheby’s is highlighting is this 18 Karat Gold, Kashmir Sapphire, Platinum and Diamond Brooch, property of a private collector. This is a remarkable brooch of stylised flowery design by Schlumberger for Tiffany & Co. and it dates from the 1960s. It is set with a sapphire of approximately 17 carats, and was formerly in the collection of Mrs. Paul Mellon. The estimate is of $750-1.0 million. Finally, one of the sections I love the most when admiring auctions jewels: the one about Jewels of Celebrated Provenance. The first masterpiece is this Important Platinum, Emerald and Diamond Pendant, dubbed The Flagler Emerald – from the Estate of Mary Lily Kenan Flagler, Thence of Descent. This exquisite 35.02 carat Classic Colombian emerald jewel belonged to the wife of Henry Flagler, the American industrialist and pioneering developer of Florida’s eastern coastline. Estimate is of $1.0-1.5 million. The second spectacular masterpiece is this Platinum, Sapphire and Diamond Necklace, suspending a Burmese sapphire of 16.95 carats, in the classic Harry Winston style. The Spectacular Bid Collection, comprising a magnificent suite of sapphire and diamond jewels, was acquired in celebration of the sport of kings from Harry Winston. The sapphire jewels pay homage to the blue silks of Hawksworth Farm, owner of Spectacular Bid, a winner of the Kentucky Derby and the Preakness and one of the top U.S. thoroughbred horses of the 20th century. Estimate for this necklace is of $300,000-400,000. Post by Claudia Carletti, Jewellery Through Time. Material courtesy of Sotheby’s Press Office.